Melissa Harrison, CEO and founder of Allee, will speak at Content Marketing World in Cleveland. 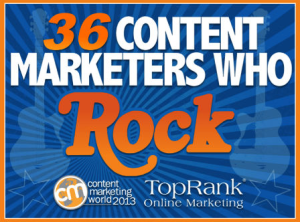 As part of this global digital marketing event, TopRank and Content Marketing Institute released their picks for the “36 Content Marketers Who Rock,” naming Melissa among the top 36 along with professionals from PR Newswire, Copyblogger, Coca-Cola, REI, Intel, Cisco and MarketingProfs, to name a few. Check out the full ebook with the other content rock stars here.